With the recent successful introduction of muskellunge in many Michigan waters, there is increasing interest in the fishery, and along with that, increased angling pressure. What was once considered the fish of “ten thousand casts” isn’t necessarily the case for most fisheries these days. 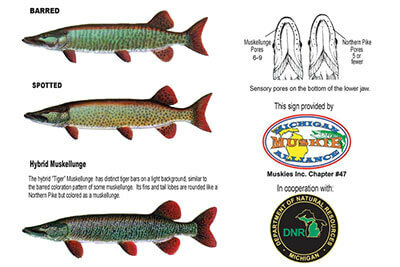 Catching a muskellunge has become much easier, thanks to stocking efforts of the Michigan DNR with assistance from Michigan Muskie Alliance. Also, because catch-and-release is now practiced by the majority of muskie anglers, many “trophy” fish are being caught and released multiple times. However, simply releasing a muskie doesn’t ensure its survival; proper handling and release practices can significantly reduce muskie mortality. But we can’t have a “how to” without first addressing the tools required for properly removing hooks from a captured muskellunge. One useful piece of advice first-and-foremost is to have a plan set ahead of time; you don’t want to be searching for release tools when you really need them. As the Boy Scouts say, “Be Prepared!” Have the net handle extended, your release tools out and within reach of where you plan to net the fish, and make sure everyone in the boat knows where the camera is and how to use it. Most anglers choose to net their muskies; a quality “muskie-appropriate” net will enable fish to be landed faster while also allowing the fish to stay in the water during de-hooking. A muskie, as with all fish, isn’t able to breathe out of the water; keeping them in the water as much as possible greatly reduces the stress the catch and release process will have on them. A good analogy might be imagining yourself running a quarter-mile, and while you’re gasping for breath, being placed underwater and be unable to breathe! Keeping the muskies head under water as much as possible while de-hooking is key to maximizing their survival. Coupled with this consideration is understanding that overplaying a muskie may exhaust it to the point where it cannot successfully recover. Effects such as lactic acidosis (a buildup of lactic acid that can cause abnormal heart rhythms) and hypoxemia (abnormally low blood oxygen level, especially occurring during the hottest summer weather) can lead to delayed mortality, even though the fish swam away apparently OK when you released it. Please don’t play the fish to complete exhaustion. Get it into the net quickly, where it can start to recover. Beckman, Frabill and Stowmaster all build good “fish friendly” nets capable of handling the largest muskies. These companies have engineered these nets with wide hoops and deep bags that allow the net to act as a holding pen, allowing the fish to remain in the water and not be cramped. This enables the angler to perform de-hooking while the muskie recovers at boat side in the water. Any muskie-appropriate net will have a knot less, coated bag that reduces slime removal, and a smaller mesh that greatly reduces the chance of damaged fins. The surgical forceps or 6″ needle-nose pliers commonly used to de-hook many other species aren’t going to suffice. When you have a muskie with a mouth full of 4/0 treble hooks and lots of large, sharp teeth to navigate. Long needle-nosed pliers (11″ or more A) and long hook-out tools are important to keep your hands away from the sharp hooks and teeth. Also, it isn’t uncommon for a hook to become imbedded in a way that makes backing the hook out very difficult, and therefore cutting the hook is the best way to keep you and the fish safe. A pair of mini compound-action bolt cutters are a must-have; side cutters aren’t going to get the job done on a 4x-strong muskie hook. There are many less-expensive models out there, but a high quality pair of small bolt cutters make cutting hooks very easy. Knipex mini compound bolt cutters (B) are widely regarded as the best tool for the job. Many anglers are hesitant to cut hooks from their favorite lure, but keep in mind: hooks are cheap and easy to replace… muskies aren’t. Once hooks are cut, removal of the remaining pieces is much easier. Don’t leave hooks in a fish, they will not rust away; the remaining hook pieces can cause infection. Other things you need are a long Baker hook-out tool (C) and mouth spreader (D). 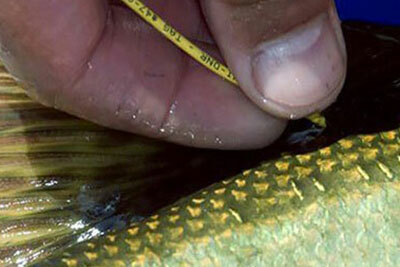 The hook pick (E) is a new tool designed to dislodge hooks that are deep inside the mouth of a fish.